Many people wonder whether they would be comfortable using contact lenses and if they are suitable for their needs, but the financial implications and a lack of knowledge about their use can be enough to put a lot of people off using them. For this reason, many contact lens manufacturers and retailers (usually found in your local opticians) offer customers and potential customers a short trial of the products. Offering a trial means potential customers can try them for a few days and see how they get on without being committed to buying several weeks worth or set up a regular monthly order. Where do I go to Start a Contact Lens Trial? 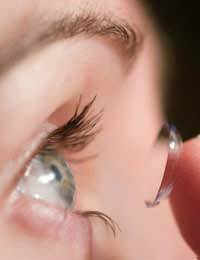 For most people, it is easier to go to their regular optician and ask about contact lenses but in the highly competitive world of contact lenses, their may be other possibilities than prove to be more beneficial to you. As there are now so many companies offering contact lenses, the choice can be quite overwhelming although this does mean that the general costs are fairly low. Some companies may offer discounts for a long term contract or for buying several pairs at once, whilst others may offer free delivery or ordering online which can be appealing to many busy users. As long as you have an up-to-date prescription and criteria for using contact lenses there are many choices available to you. How do I Organise a Contact Lens Trial? The easiest way to commence a contact lens trial is to pop into your nearest opticians and ask their sales advisors for an appointment. If you have not had a sight test for a while (over a year in most places), you will probably need to sit a test and eye examination before you are issued with any lenses. The staff should explain the different types of lenses that are available to you and teach you how to correctly insert and remove them, along with any hygiene and cleaning regimes that will need to be carried out. After this you may be offered a few days trial of the lenses without the worry of being committed to a contract or anything similar following the trial. When you have tried the lenses and are either happy with the result or dissatisfied, you return to the opticians and discuss your opinions with the advisor who will then either discuss trying another type of lens if you weren’t entirely happy with the product or endeavour to find out if you would like to buy more lenses or set up a monthly, two monthly or three monthly arrangement for future lenses. There are associated risks with almost any activity and contact lens trials are no different although the risks are negligible. Always make sure you go to a reputable dispenser or optician and do not allow anyone to offer you lenses without first checking you have an up-to-date prescription or have had an eye examination. It is vital that you are taught how to insert, remove, store, clean or dispose of the lens after each use along with any hygiene issues that may be associated. It is also a good idea to make sure you do not sign anything or commit yourself to buying further lens after the initial trial as some companies may try this tactic to get business out of you even if you don’t want to use the lenses after the trial. Contact lens trials are an excellent way of learning about contact lenses and whether you are suitable for their use in the long term. Trying a few free samples over a couple of days may be enough to either give you the confidence to buy more or confirm that you cannot get on with them enough to use them regularly (although you can use them intermittently if you want to).Have a pop in and a chat with your local optician to find out more information or to arrange a trial.